A minimum prize fund of £10,000 has been secured for the David Wood Memorial Trophy short circuit meeting at Bishopscourt in September. 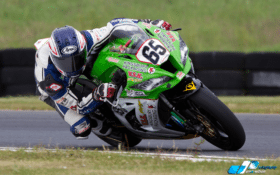 Promoted by the Motor Cycle Road Racing Club of Ireland Ltd, this year will be the third running of the event, which will take place at the Co Down circuit on Saturday, September 17. IFS Global Logistics have been confirmed as the title sponsor of the race in 2016. The company has been a long-time sponsor of Ulster motorcycling for many years, previously backing Team Wood rider James Courtney on the IFS Ducati. Charles Hurst Motorcycles (Belfast) are also on board and the feature David Wood Memorial Trophy Pirelli Supersport race will see a cheque for £1,500 going to the winner. Nikki Coates is the current champion after narrowly retaining the trophy last year after battling it out with Robert English. A club spokesman said: “Our thanks goes to Graeme Hanna at IFS for his valued support as it was important for us as a promoting club to attain a title sponsor for this event, which will hopefully help secure the foreseeable future of the event.